At eight years old, Darla opened her heart to Jesus at a Vacation Bible School. Six years later, she received a compelling nudge from the Holy Spirit when she heard a missionary speak at a Christian camp. From that point on, her goal was to become a medical missionary. For twenty years, she accumulated life experience as she raised three sons and worked as a registered nurse. Finally, her opportunity presented itself, and Darla received an offer to travel to Kisumu, Kenya, with a community development team. As she learned the local tribal language and became acquainted with many of the street boys, she was touched by the tragedy of their lives. As a result, she founded Agape Children’s Ministry with a leap of faith in 1993. The ministry has grown by God’s grace beyond all expectations. 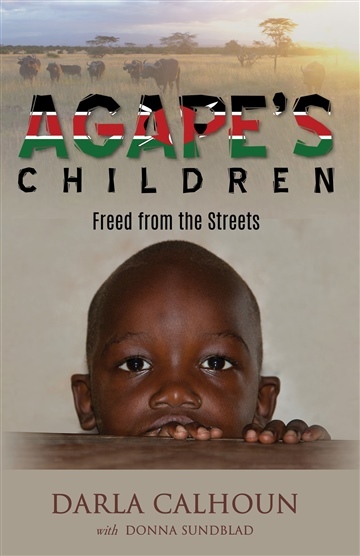 To date, over two thousand children have been rescued from the streets. Darla and her husband, Dr. Paul Calhoun, former president of Medical Ambassadors International, were married in 1995. Between them they have five sons and seven grandchildren. They make their home in Glendale, Arizona.